today I'm looking at Altenew's layering stamps, Main Squeeze and Bride-to-Be, to create some fun "2-for-1 cards". 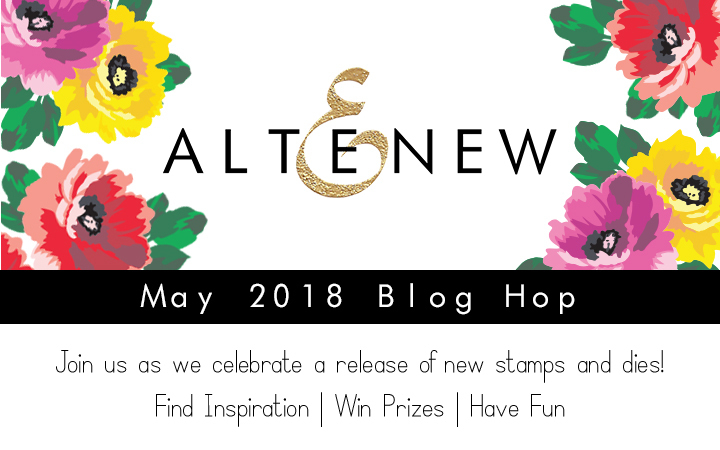 Altenew has a fabulous new release and the products I'm using today are some of my favourites. I stamped out a bunch of the layered flowers from the Bride-to-Be set and die cut them all using the coordinating dies. I then stamped a few random flowers onto my card panel. I arranged the die cuts around the stamped images to create a variety of dimension. I then die cut the panel using a stitched rectangle die. I used the frame that was left over to create my second card. 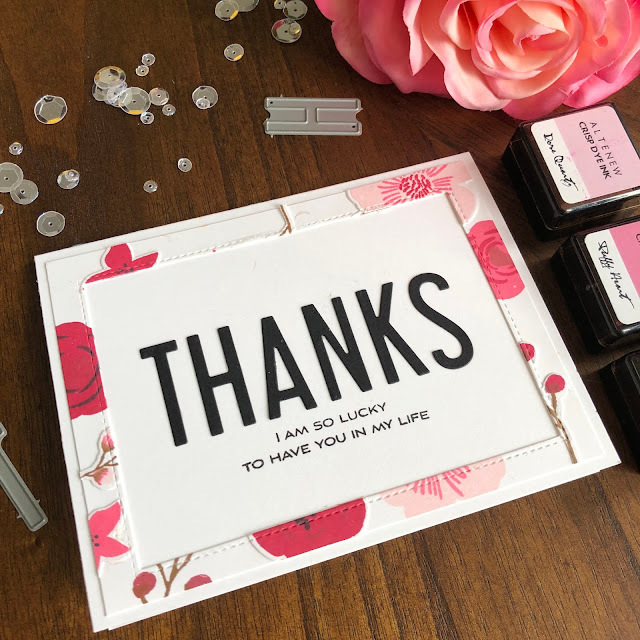 I die cut the word thanks using the Fine Alphabet die - a perfect alphabet set for cardmakers. Renate Harrison! - Please contact me using the contact form below to claim your prize! To celebrate this release, I am giving away a $30 gift certificate on my blog for commenting! Additionally, Altenew is giving away a $50 gift certificate to 6 lucky winners! Please leave a comment on the Altenew Card Blog and/or Altenew Scrapbook Blog by Friday, May 26th for a chance to win. 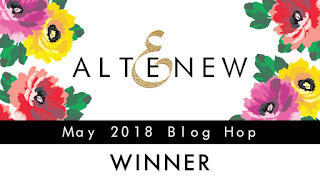 6 winners will be announced on the Altenew blogs on 5/27/2018. For my second card, I stamped the Main Squeeze elements onto a background. They are so realistic and life-like. You can change up the colour to turn these into limes and grapefruits as well. So versatile! I used the same technique to get two cards out of the deal. I also used the alphabet dies to help emphasize one of the sentiments I used from the set. Great cards - love when you can combine sets. Fab creations. Love the bride to be stamp set, and I love the color combinations you used in both cards! I feel like I could take a bite of your card and taste lemonade! Love it! Beautiful cards!! I love the citrus stamps! Your card creations are gorgeous. Thanks for sharing your talent with us. Of course I love your cards! I always do. I appreciate seeing another outside my normal box way of laying out a card. Beautiful! Thank you for the inspiration. 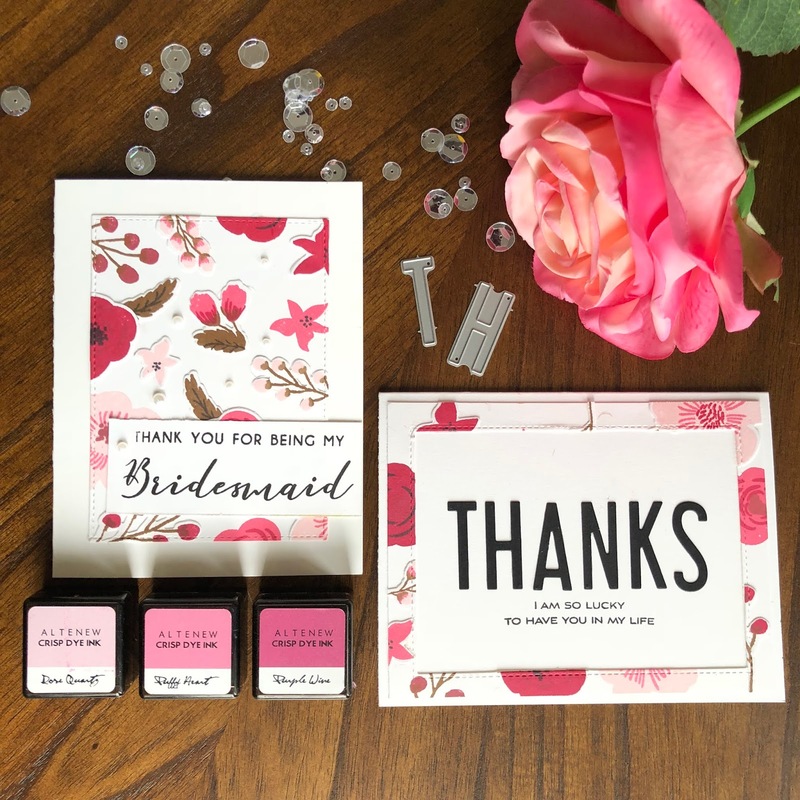 I especially love the Bride to Be stamp and die set and the colours that you used. I love the idea of making 2 cards from just one background creation. Thanks for the inspiration! Stunning cards - love the wedding stamp set. So much more versatile than I'd have supposed. pretty colors you used on all your cards. Wonderful cards! Love this new release! Great cards! I love the alpha set! Beautiful cards, I love the sentiments in the Main Squeeze set and the thinner alphabet dies. fantastic release from Altenew. Love the 2-in-1 cards! Your background on the first one is beautiful and inspiring. The colors on the second card is so bright and bold...LOVE IT! I especially love the fruity card. It looks so juicy and realistic! Love how a few designs can work for multi sets!!! Great cards!! Love the Main Squeeze. cute and pretty love the colors! What a beautiful Bride to Be card and so excellently done! Love Main Squeeze especially!!! With hot summer months ahead, it would be a delight to send you sweet card! All must have stamp sets!! Fabulous card sets!!! Love making those 2 out of 1 cards! Love the fruity sentiments and your gorgeous color combos! I love the Lemonade card! Great ideas for inspiration! Fantastic cards. I really appreciate when you show us how to combine sets so we get more from them. And i like when you show how to make another card from "leftovers". Great cards, Justine! Love the new release from Altenew. Thank you for sharing these lovely designs. Happy Victoria Day. I loved the floral card, until I scrolled down to the citrus card. I love that one even more. Orange is my favourite colour. Thanks for sharing. Great inspiration to make these 2-for-1 designs. Love the beautiful ink colors you chose and I'm sure the recipients of these will smile when they receive them. Thanks for sharing your creativity on how to use this new set of stamps. Great cards in lovely summer colors. Thanks for inspiration. Your cards are beautiful ! I love the happy colors. I am a sucker for monochrome so these cards are like...my dream come true. I love everything about all of these and those citrus cards...literally look good enough to eat! I love the card with the pink flowers. I have been collecting Altenew ink cubes. I love how they coordinate. Just love your cards! The color, composition... beautiful. Your cards are lovely! I am totally stealing your die/stamp mix technique. I love your beautiful cards! Very fun and playful cards! Love these! Beautiful and playful as well. Normally I am not tempted by food stamps, but I might have to partake. Fantastic designs! Love the variety in your style and how well you displayed these new products! Beautiful cards! I love how you made 2 cards from one background! What a great idea! 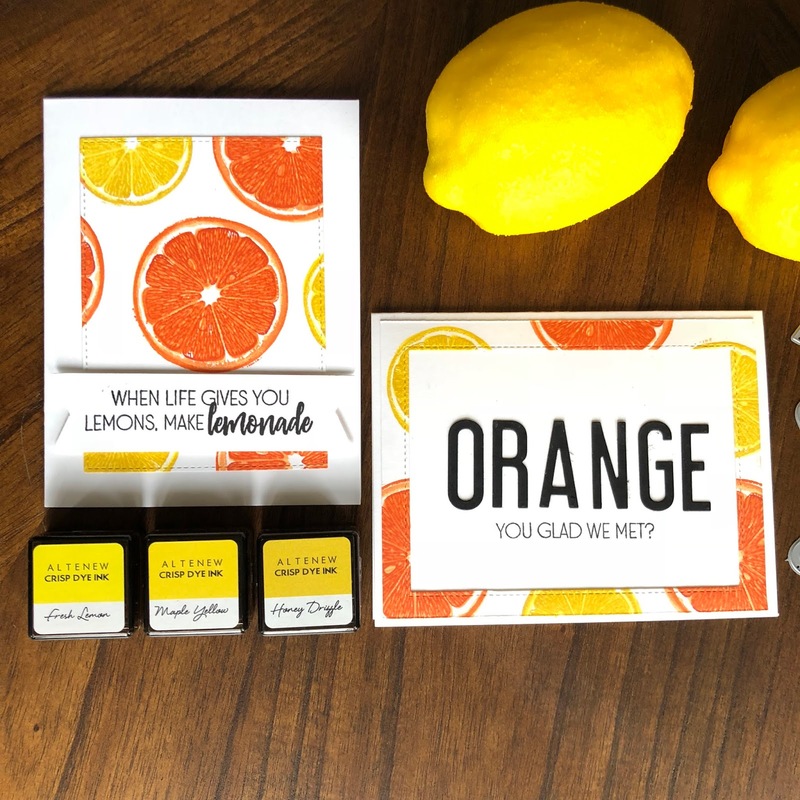 I love that citrus stamp set, can't wait to get ahold of that one!! Thanks for the great inspiration! What beautiful colors on your cards. The color choice on the bridal stamps is my favorite. The citrus card is so beautiful. Love all the colors. Love the flowers. These cards are amazing. wonderful cards, Justine - love the new alpha dies! Lovely cards Justine. Love the sweet bride to be set... those floral images are darling... pretty pink hues! I for sure will be making some cards like this! Thanks for sharing! These cards are so cute and SO creative! I love the alphabet and the fruit! Super cute cards! I love the colors you chose for the flowers. As usual, you did great. Thanks for sharing. Great cards! I'm especially loving that new citrus stamp, it's so realistic! Really cute cards Justin, Love your 2 for one design! I love the lemon stamp and die, perfect for a summer card. The yellow just pops off the page. Great cards! Hi Renate! 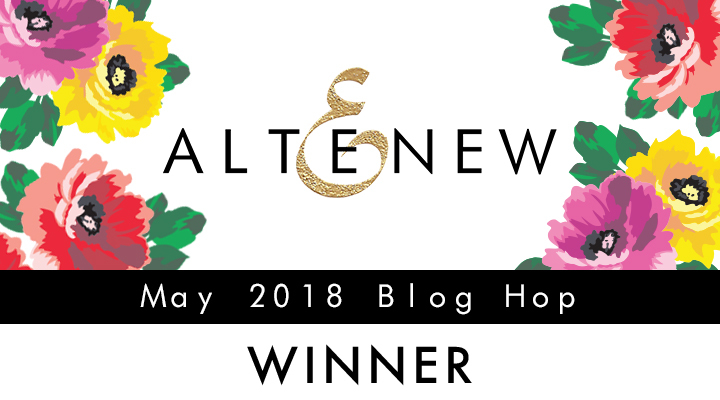 You are the winner of the $30 gift certificate for Altenew! Contact me using the contact form at the bottom of my blog to claim your prize! These cards are beautiful as always Justine!! Altenew is becoming one of my new favorite stamps companies because of you and your inspirations!! so many great ideas and products with this release. thanks as always for sharing. so pretty and cute. I like the color combos you used. So pretty! Bride-to-be is such a great new set!! Love your cards....the citrus set cards are my favorite. Thanks for sharing your talent with us. Great cards, Justine! I love the Bride-to-Be stamp set. The colors you used for the flowers are beautiful. I like the Main Squeeze set as well. Your oranges and lemons look so refreshing! Wonderful colors on all your wonderful cards. Thanks for sharing your talent with us. Love your two-for-one cards! Beautiful colors and designs! Amazing, so beautiful. Love the new release. Such beautiful cards! I can't get over how realistic the stamps are in Main Squeeze. Love all the cards...you did a great job! FUN and lovely choices to highlight!!! So inspiring! Love both of your cards. 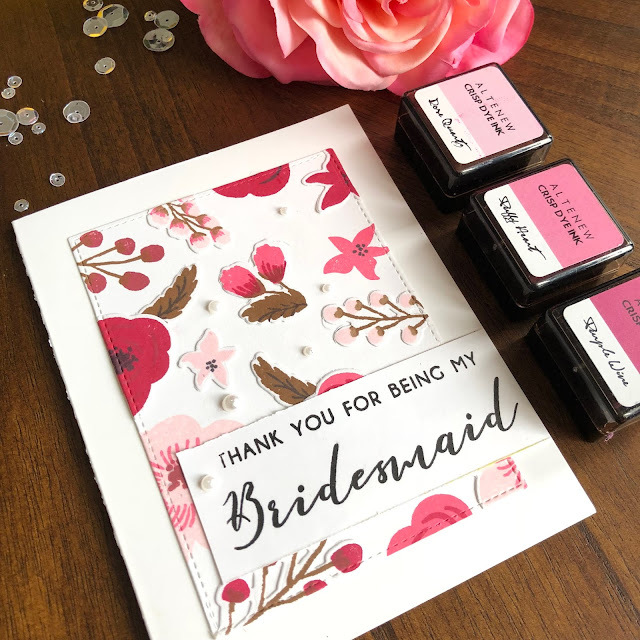 The Bride to Be Stamp is so pretty and I love what you did with the citrus. Great job. The Main Squeeze stamp set is AMAZING! Love your 2 for 1 technique! Thanks! Fantastic cards Justine! The florals are sweet and lovely, love the color combo. 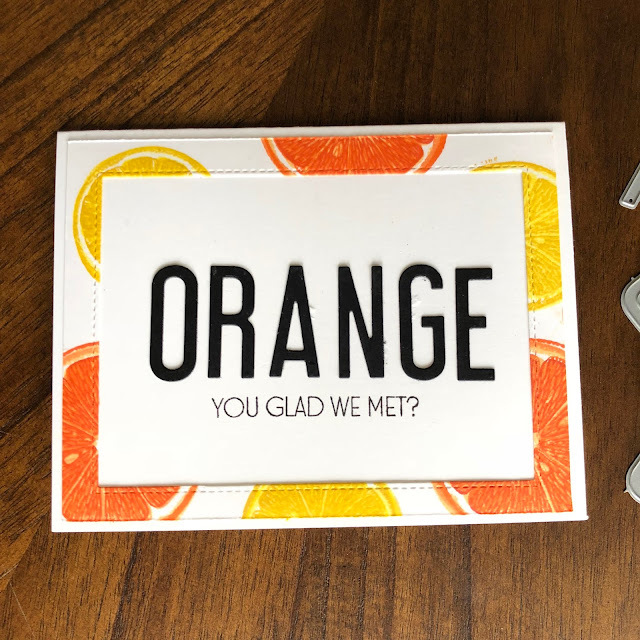 The citrus cards are bright, happy and fun. Great stamps! I love how used the frames to make more cards! Nice job! I love getting two cards for the effort of one! Your cards are always delightful! Bold sentiments on colorful backgrounds. These cards are all so bright and beautiful!! Such wonderful cards. The lemon stamp set looks so real when stamped. Great release. Wow, just love them both. The colors and stamps! Thanks for sharing! Love these cards! The orange one is my fave, I may have to borrow this idea, I simply love it! These are fantastic! So bright and cheerful! Wonderful designs. Love the lemons and the sentiment. Oh Justine- I love these stamps! Super cute! The colors are so beautiful, I just love Altenew inks. Wonderful cards, Justine. I like how you used "leftovers" to make a second card. Thanks for sharing. Those fruity stamps are calling to me! Fantastic cards Justine, I love that the oranges and lemons look so realistic. So pretty - love the flowers and the orange and lemon slices. Love your "two-for-one" technique!! And your color combos on all the cards are just amazing! Great inspiration, thanks. These cards are so fresh and fun! Your citrus card really feels like summer is here! I'm just starting to experiment with the crisp color cube sets from altenew and am inspired by the great results you got. The florals in the similar tones for the bridesmaid cards are so soft and simple. Fabulous cards Justine! I'm really loving the Main Squeeze set! Love the cards you created, and really like the 2-for-1 idea for card creating. Thanks. Beautiful cards, love the 2 cards for 1 stamped panel! The citrus set is one of my faves of this awesome release. Thanks for another great video tutorial too. Beautiful cards! Love your color combos! Awesome new stamps and dies! Now I know why the pocket full of sunshine mini cube set is all sold out: all the designers needed it to make lemons for this release! :D I'm not one who often goes for the yellows and oranges either, but for this, I will make an exception! I love 2-for-1 cards, because I always seem to need more cards than I have, so thanks for sharing this great technique. I love these new products from Altenew, thanks for sharing them with us! Love these bright cheery cards, edpespecia the idea of a twofer! What a terrific design! I love it! Really fantastic cards! I love the fruity stamps. 2 for 1 cards are the best! I love the humor on your citrus cards! Orange you glad I noticed! Hee hee hee. The bridesmaid card flowers are so elegant and it almost makes me wish I was getting married again; so I could make these cards. However I don't want to give up the hubby I have or try to wrangle him again so I will just admire the flowers in examples :) Lovely cards and thank you for sharing! Fabulous cards! Love the oranges and lemons! These colors and the cards you made are so bright and cheery! Fun cards. Love your floral and video! Both cards are fabulous! I am really liking the Main Squeeze set. The alphabet dies are a must have, love your cards! Okay, you're cards are beautiful and creative, but more than anything you have me at the inks. You're oranges and lemons look more realistic with the different tones of yellow/orange you used. The flowers are so beautiful. I'm in awe!! 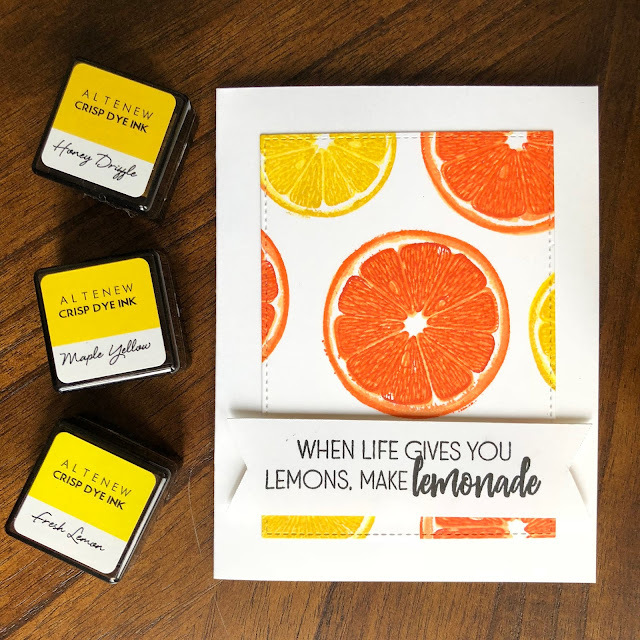 first off, I did think of not being able to use that orange/lemon stamp a lot, but being able to convert it also with limes and grapefruit does make it more versatile. gorgeous and vibrant inks for these wonderful stamps. I have just bought the Bride to be set - you inspired me! Very bright and cheerful cards. Love your cards, Justine! Your creativity is awesome! Thanks for making the video explaining how you made the cards...so helpful!